Follow me on Instagram for constant inspiration : @kadali.interior or check out my personal twitter to stay up to date whenever I post in here! Hi guys !! I hope you had a great week. For some, it’s one of the last weeks of summer, for others it was aleady back to school or back to work. It’s still summer for me but although September is the month I go back to school (yay or nay?! ), it’s actually also my birthday month which is absolutely exciting for me. I get to grow a year older in 4 days and that’s the kind of fresh start I like to have! (Talk about new beginings, right?). And wait for it, I will officially graduate from college in less than a year .. Errr I don’t know how I feel about that part so let’s just pretend I did not say that, shall we?! So since it’s back to school season and back to work for most of the people I know, why not talk about work areas! After all, that’s where it aalll goes down. 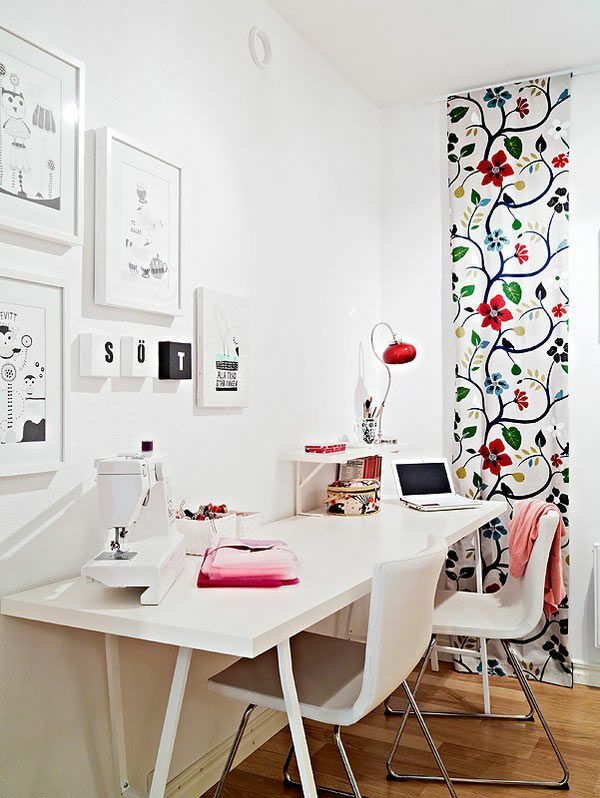 I am litterally so obsessed with desks and offices and how to decor those kind of spaces. I love how the way you design your work place can change the dynamics and make you work harder, or smarter (which is better!). At least for me, I try my best to keep my work space as inspiring as possible. 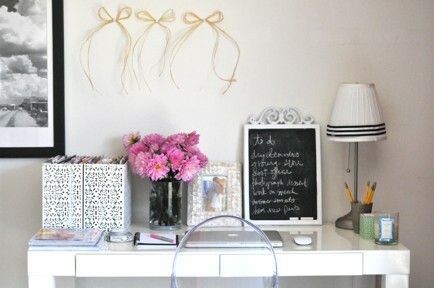 It keeps me inspired enough to want to work and being organized is the key to it all. Tip #1 : I would say find a colour theme. It could be your favourite colours and you can go as neutral as possible just like you can go crazy. Like it shows in the first picture, don’t be afraid of using flowers and bouquets to change the colour theme of an all white space. Also if you prefer having a rather strong undeniable colour, make sure you pair it with white or gold or black. Point is, a statement colour to pop and the rest is still pretty basic! Tip #2 : Make sure you always declutter! Seriously, it makes a world of a difference. If you don’t clean at least once in 2 days, it’s all going to build up and it would be overwhelming for you to clean all at once. A great way is to take 10 minutes a day and I promise, it makes a huge difference! 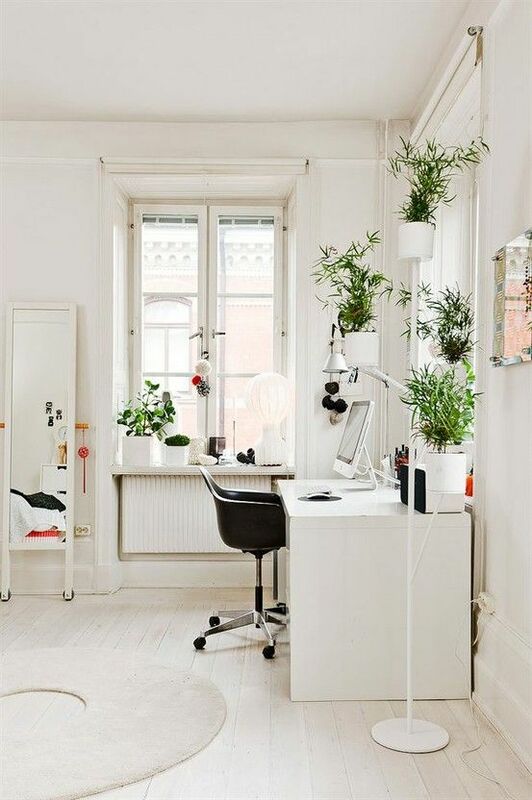 I love this white office and green life! So refreshing and I actually plan on changing up my colourful bedroom into this fresh and crisp all white look. It can definitely be for men too ! 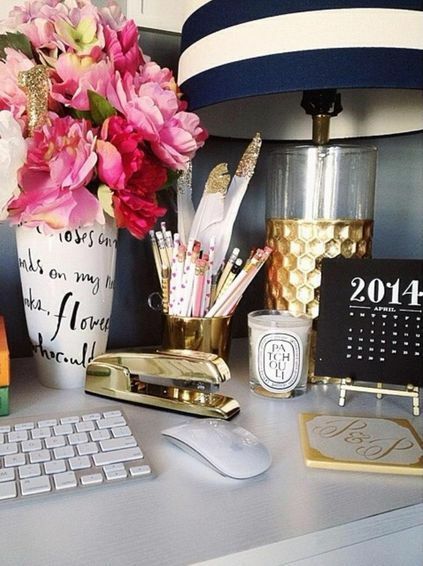 Tip #3 : is definitely have little jars or cups that you recycled (or that you bought) to use on your desk. Wether it be for pens and pencils or little post it notes. This way you’ll have everything stored in one place and have total control over it. I really like this theme for all the gentlemen out there. Such a rich beautiful colour and that rug just ties all the colours of this space together! There you go guys! I don’t know if you made it this far, this post is pretty long and if you did, I loove you for it! I hope you found this post somewhat helpful and got to take some advice or inspiration from it! I also hope you are excited to go back to school/work if you haven’t already! Now go have a great weekend exploring with your family and friends or just treat yourself for a day at home relaxing after a long week. Either way, I hope you feel as inspired as I am. 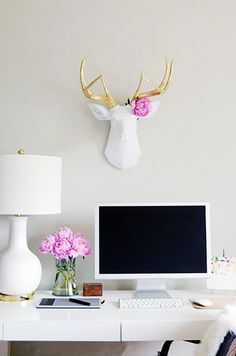 •Tagged avoir un bureau à la maison, back to school, décoratrice à casablanca, décoratrice d'intérieur à casablanca, décorer un bureau, décorer un espace de travail, école, home office, how to organize a home office, organiser son bureau, organiser son travail, trouver une décoratrice à casablanca, un bureau à la maison, work, working•Leave a Comment on Working can be fun!